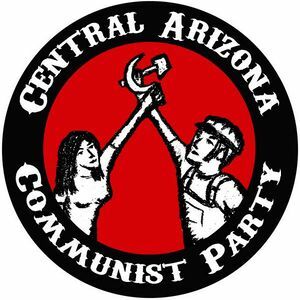 The Arizona District Communist Party USA is affiliated with the Communist Party USA. The Communist Party USA (CPUSA) liked to publish "May Day Greetings" and "Cinco de Mayo Greetings" in their Party newspaper, usually in late April, early May, from their state and local Party clubs and supporters, often under the name of "Friends of the Daily World", etc. From the "Special May Day Greetings, 1989" issue of the "People's Daily World" (PDW), Section B, we read the following: "Tucson's progressive community congratulates the PDW on its anniversary and sends May Day greetings to all our friends across the country. The need to struggle against nuclear holocaust, to preserve a liveable and pleasant environment on our planet, and to bring peace, justice and economic well-being to all humanity is now more apparent than ever. Join us to make a better world." From "Southern Arizona's progressive community" People's Weekly World May Day 1991, page B-3 "With sorrow we remember the hundreds of thousands who died in George Bush's Middle East War"
The People's Weekly World May Day Supplement, 1993, carried greetings from "Arizona's progressive community"
The People's Weekly World May Day Supplement, 1994, page J carried greetings from "Arizona's progressive community"
The following May Day greeting was included in the Special May Day 1996 Supplement of the People's Weekly World. "Arizona's progressive community extends May Day and Cinco de Mayo greetings to all our friends across the country. We welcome the growing resistance to the Republican "Contract on America" and call for a bigger, more unified, and more active fightback. We commit ourselves to building a broad people's coalition that will "boot Newt" and his right-wing gang out of Congress come November." The following May Day greeting was included in the Special May Day 1997 Supplement, page D, of the People's Weekly World "Jobs & Justice". The following May Day greeting was included in the Special May Day 1998 Supplement, page F, of the People's Weekly World - "We commit ourselves to join labor and other progressive forces to turn Congress around come November". The following May Day greeting was included in the Special May Day 2000 Supplement, page D, of the People's Weekly World - "We have been inspired by the broad people's coalition that confronted the WTO in Seattle". Arizona's progressive community extends May Day and Cinco de Mayo greetings to all our friend across the country. We commit ourselves to resist President Bush attacks on programs that serve working and poor people. "Arizona's progressive community extends May Day and Cinco de Mayo greetings to all our friend across the country. We commit ourselves to resist the Bush administration's drive for ever-increasing military spending and a neverending state of war. We must redouble our efforts to build a broad people's coalition that will drive the ultra-right out of Congress next November." We call for peace with Iraq. We commit ourselves to resist the ever increasing military spending and promises of never-ending war. We must re-double our efforts to build a grassroots peace movement...."
We reject the Bush administration's policy of aggression, intervention and intimidation, that has alienated our country from the majority of the world's people. Arizona’s progressive community extends May Day and Cinco de Mayo greetings to all our friends across the country. We commit ourselves to join the struggle for jobs, equality, national health care, a fair immigration policy, and for peace and justice in the Middle East. Let’s make this planet a good place to live for all its inhabitants. Clyde Appleton, Mary Elinor Adams, Rolande Baker, Anne Brenner, Joe Bernick and Cat Stelman, Nancy Bissell, Jack Blawis, Don Buchanan, Richard Boren, Susan Clark, Rebeca Cartes, Eugenia Chilton, Jack DeWeese, Howard Druan, & DD Sande, Gregory Feesl, Ray Figueroa, Brian Flagg, Michael Flower, Sean Fowlkes, Nancy Gallen, Maggie Gerring, Michael Gray, Nancy Graham, James Hannley, Beverly Halkias, Jeff Imig, Mansur Johnson, James Jordan & Raquel Mogollon, Frank Jents, Marilyn Kramer, John Kromko, Jim Kincaid, Brandy Lintencum, Rob McElwain, Mary MacEwan, John Mackoviak, Jane Martin & Bob Vint, Jon Miles, Nancy Myers, Kathy Norgard, Richard Osburn, Ismael Parra, Nancy Pontius , Alice Ritter, Carlos Salaz, Sr., Mazda Shirazi, Rosemary Solarez, James Stewart, Brian Stevens, Olga Strickland, Donald Tewels, Dennis Tallent & Laura Tallent, Anita Torrez & Lorenzo Torrez, Carolyn Trowbridge & Keith Bagwell, Susan Thorpe, Steve Valencia & Janet Valencia, Edward Vargas, Steve Wheaton, Michael Wheeler, Susan Willis , Wendell Wilson, Deb Wilmer. ↑ Special May Day 1966 Supplement of the People's Weekly World, P. H.
This page was last modified on 21 July 2018, at 05:02.